Many of the poems were inspired by and examine the conditions that led to masses of young Zimbabweans leaving the country over the last fifteen years, the lives that both those who stayed and those who left went on to live and the effects of this migration on the country, on communities, on families. 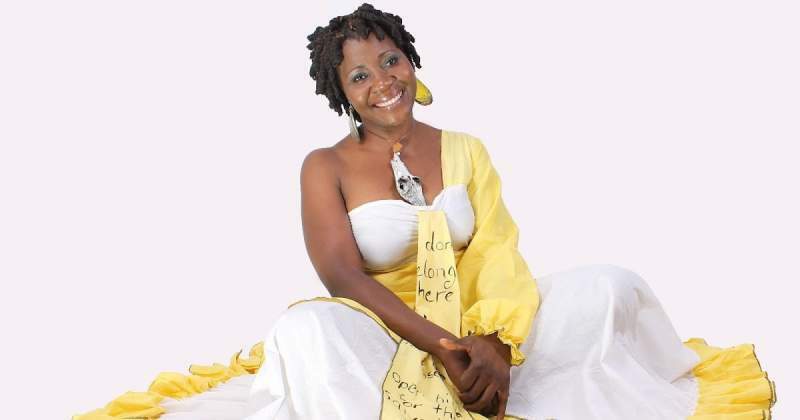 Chigama has performed on many spoken word stages in Zimbabwe and beyond, starting with the famous House of Hunger poetry slams held at the Book Cafe in 2004 and then the Sistaz Open Mic events that followed. Her work deep, searching poetry asks questions about the socio-political situation and women's issues and has been featured in over 15 anthologies. These include 'State of The Nation,' (Conversation Paper Press, 2009) and 'War Against War,' (Mensa Press, 2010). In 2014, she came second in the digital slam organised by Stanza Poetry Festival (Scotland) ahead of eight other contestants shortlisted from all over the world. 'Gather the Children' is the result of over ten years of work. In one poem, 'We Must Bury Mother,' a 50-year-old man who has just come home keeps on telling his sibling that they must bury their mother. The sibling responds that she's been buried for 8 years, but the former doesn't have a recollection of this because, as often happens with Zimbabweans these days, he was away when their mother died and unable to attend the funeral. In another poem titled 'Zimbabwe,' Chigama subtly reminds us of the pain of the last fifteen or so years. She writes, 'Like eating Olives/ we have acquired the taste of discomfort/ over the longest time/ it has settled gently on our tongues/ with the likeness of forgotten dreams/ small things too much a luxury/ for us to hope for/ Without water to flush the system/ We are eternally constipated. Chigama also mentors young poets in schools and last year was the poetry mentor in the These Images Are Stories project which brought 20 young women from Harare and London together in a digital collaboration project which used poetry and photography to explore issues that affect young women today. Chigama says that she came to poetry slowly, over time. "That I could be a poet, wanted to be a poet was a gradual realisation. Writing has always been cathartic for me and the more I found people could relate to what I wrote and sometimes performed, the more I wrote and found the confidence to share my work." The performance that sticks out most in her mind as a spoken word artist was at Poetry Africa in 2011. "Sharing the stage with poets I have always read in books; Lebo Mashile, Barolong Sebone, Mutabaruka, the late Chiwoniso Maraire (a great influence through her music), was my most memorable performance. I remember I was shaking so hard when I went on stage and shaking after the performance. Another highlight is a tour of Danish schools in 2014. It was the beginning of the current programme I do in local schools. I came out of that tour richer and empowered to start doing workshops and mentoring young poets." The launch of the anthology will take place at Alliance Francaise in Harare and will feature acoustic performances by talented Mbira player and singer, Hope Masike and well-known drummer, Mangoma.